Playable, customizable female characters suit up for both singleplayer and multiplayer. It's easy to doubt the significance and importance of online petitions, but every now and then they can make the voices of gamers heard. Such was the case when Gearbox producer Brian Burleson stated that Aliens: Colonial Marines' multiplayer modes would exclusively feature playable male characters. Aliens fans found this a little odd, considering that the series is among the most female-centered franchises of science-fiction, so a petition was quickly filled with almost 4000 signatures demanding that the oversight be corrected. The efforts have attracted the attention of Gearbox CEO Randy Pitchford and Community Manager Chris Faylor, who revealed that Colonial Marines will not only have playable female marines in its competitive multiplayer mode, but in the co-operative story campaign as well. "I am happy to be able to confirm that female marines are playable in competitive multiplayer as well as co-op, complete with customization elements," Faylor wrote to the petitioners. "This is something the team has been planning and working on for quite some time, and that work is finally at the point where we can confirm it will indeed ship with the game when it releases on February 12, 2013." Pitchford has also confirmed that playable female characters are in the works, adding that Gearbox simply hadn't wanted to show anything off until it was in a finished state. 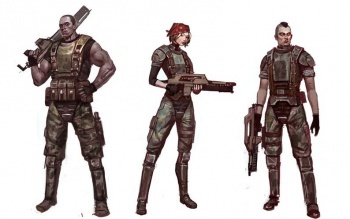 The petition and subsequent media attention forced a change from this position, so fans are being treated to the early reveal of Private Jennifer Redding, a playable female character for the story campaign. Competitive multiplayer modes will also feature male and female characters, along with customizable armor modifications, weapon upgrades, and even the ability to write slogans and messages on your equipment. It's easy to be skeptical of the claim that female characters were always planed for Aliens: Colonial Marines when there is enough content to create multiple trailers using in-game footage while playable females are still in the design stage. Still, that's not nearly as important as the fact that female gamers can don armor and wield flamethrowers against Xenomorph hordes with their female avatars, just like Ripley would have wanted.